The leaves on Wellesley's campus have changed to orange and yellow, which means for many it’s time to start thinking about Halloween. This Halloween season, visitors can enjoy several “haunted happenings” at Wellesley, starting with the first events later this week. On Saturday, October 25, join the Wellesley College Tupelos (and, according to Twitter, invited guests, the Williams College Springstreeters) for their annual Spookie Tupie Teaser at 7 p.m. in the Tower Great Hall. 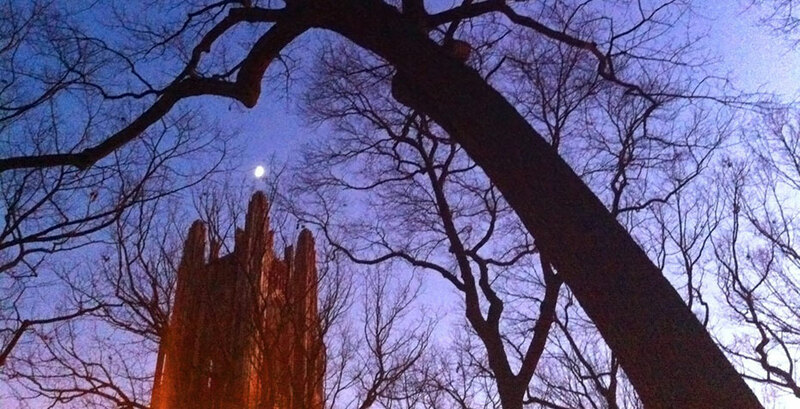 On Sunday, October 26, the Wellesley College Guild of Carillonneurs invites visitors to the Haunted Open Tower. “During Haunted Tower, our carillonneurs play spooky music (or, anything in a minor key). All are invited to come in costume!” says Lia Gallitano ’15, president of the Guild. Thursday, October 30 offers a couple activities for night howls. The ASTRO Club will host a Haunted Observatory night in the Whitin Observatory beginning at 8 p.m. Everyone is invited, but there is a $5 cover charge for non-Wellesley students. “It'll be spooky and science-themed, not to mention we'll have a ton of space-themed snacks,” says Rose Gibson ’16, a member of ASTRO Club. After you visit the observatory, head to Jewett Auditorium where The Film Society will be screening Rocky Horror Picture Show starting at 10 p.m. Doors open at 9:30 and costumes are encouraged (and don't forget your toast). According to Film Society President Sydney Butler '15, "We’ve definitely held screenings on campus for the last eight years and, I would wager, probably for much longer. Rocky Horror has such a cult following—technically, it’s the longest running theatrical release because Fox has never pulled the film from its original release in 1975." Shakespeare Society members will be on hand to provide "an amazing shadowcast to the film," says Butler, who also notes that the SHEs (sexual health educators) plan to have a table outside the theater this year. On Halloween day, Friday, October 31, the Shakespeare Society will present its own Haunted House. “We present scary scenes from Shakespeare's canon in various rooms of our house,” says Catherine Piner ’16, Shakespeare Society president. The event will take place at Shakespeare House from 5:30 to 7:30 p.m.
On Monday, November 3, El Día De Los Muertos celebration takes place at 5 p.m. in Tishman Commons. El Día de los Muertos is an annual tradition celebrated mainly in Mexico and by people of Latino heritage residing in the United States. This year at Wellesley, guest speaker Debora Vasquez, a Chicana multimedia artist, will explain the significance of the event, and there will be performances by Wellesley's Latin@ dance troupe, Cielito Lindo, as well as by Mariachi Estampa de America band and singer Bianca Sapet. There'll be traditional Mexican food and face painting activities too. "We encourage everyone in the community to help us decorate the altar by bringing a photo of their loved ones who have passed away," says Mared Alicea-Westort, assistant dean of intercultural education and advisor to Latin@ students. Some House Councils are also getting in on the Halloween fun (like Tower, which hosted trick-or-treating on October 21) so, students, be sure to ask around!